New build HD video assist for Arricam LT, modern outputs. IndieAssist mounts directly on the fixing position of the original Arricam LT assist. or to 16:9 when shooting in 3 or 2 perf. This is set internally and can be changed by a technician when changing movement. Pre-owned L'aigle Exoskeleton 'G' Mk2 for sale, privately owned. As seen in pictures, with case. Pre owned Flanders DM 250 monitor for sale. Some light wear from using. Mini Worral geared head, Cinema Products for sale. Private owned, in good working condition. Head, MOY tie down, spare pan cable, 2x chrome brass wheels, bridge plate, and flight case. Overhauled every 5 yearsat MovieTech Munich, updated electronics. New track wheels, outer wheels and bearings. 2x load tracks, Bus is in good condition. several Aaton XTR prod mags for sale in used but good condition. K5600 Joker-Bug 400w second hand kits for sale. Equipped with first generation electronic ballasts (no dimmer and no high speed modes). There is guarantee for a 6 months period. It is recommended to purchase a new spare bulb as it is not clear how old the bulb is included in the kit. K5600 Joker-Bug 800w second hand kits for sale. Arri FF3 follow focus in 15mm. 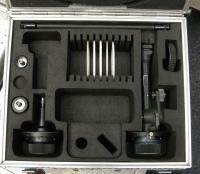 Arri FF2 follow focus for sale in 15mm. MB18 Matte box in 15mm. Cmotion 3 motor wireless follow focus. Arri WCU3 remote handset in good condition, ex-rental. Arri WCU-3 with CLM-2 motor and UMC-3, cables. 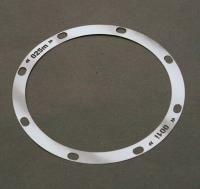 These precision shims are made of stainless steel, there is only a margin error of 2 microns. Product numbers per shim you can find in the pdf file, left bottom of this page. RedProPrime shims RPP only in selected sizes, rest is out of stock. 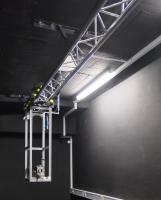 Lens projector set up on ceiling, for easy handling of the lens projector. Floor is free of rail, easy to walk around the projector. Set up is custom made, with given measurements. Rail and dolly package for sale without the projector. Bright Tangerine matteboxes for sale. Strummer DNA, Viv, Misfit, Misfit Atom and others for sale. Items are new, mint condition. New in the box with guarantuee.